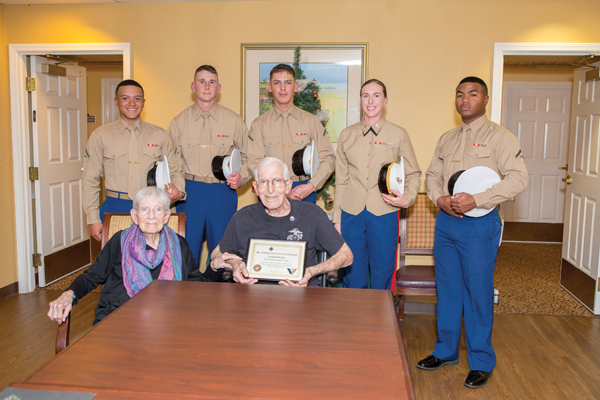 Carlsbad resident Leonard Pecchia joined the Marine Corps in 1944. Shortly after boot camp, he was shipped out to the South Pacific as a member of Company H, 3rd Battalion, 26th Marines, 5th Marine Division. By February of 1945, Pecchia was held in high regard by senior Marines in his platoon for his leadership and was appointed as a fire team leader at the start of the historic Battle of Iwo Jima. On March 2, 1945, during the Battle of Iwo Jima, Private First Class (PFC) Leonard Pecchia braved harrowing enemy fire to aid a fellow Marine who had been wounded and was stranded on the enemy-side of a ridge. Ignoring his own wounds, PFC Pecchia retrieved and evacuated the wounded Marine. PFC Pecchia was awarded the Silver Star for his bravery and the actions he took out of “grave concern for the life of another,” his citation states. He also received the Purple Heart. 1st Lt Kimberly Colby, USMC and four other Marines from Camp Pendleton read Mr. Pecchia’s citation from 73 years ago and conducted an Honor Salute in recognition of his military service. 1st Lt Kimberly Colby volunteers with The Elizabeth Hospice to recognize and thank veterans for their service in the Armed Forces. The Elizabeth Hospice is a “Level 4 Partner,” the highest distinction possible, with the National Hospice and Palliative Care Organization (NHPCO) and the Department of Veteran Affairs (VA), – in the national We Honor Veterans program. 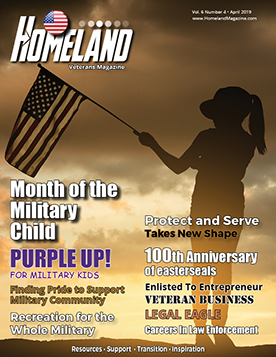 An important part of our program are our volunteers; veterans and active duty military personnel.